Running a bistro or a coffee shop is a very outgoing, energetic and demanding job. Although it looks like a non-stop party to other people, coffee shop owners know just how much of their time and effort this business takes away. All this energy is often rewarded, but nowadays it’s not enough just to run the business right in order to get the proper reward for it. There are so many coffee shops out there, a good businessman needs to take his business to a new level and advertise their coffee shop so it stands out amongst many other similar ones. The best way to do this is of course by presenting your business online, and presenting it with great style. 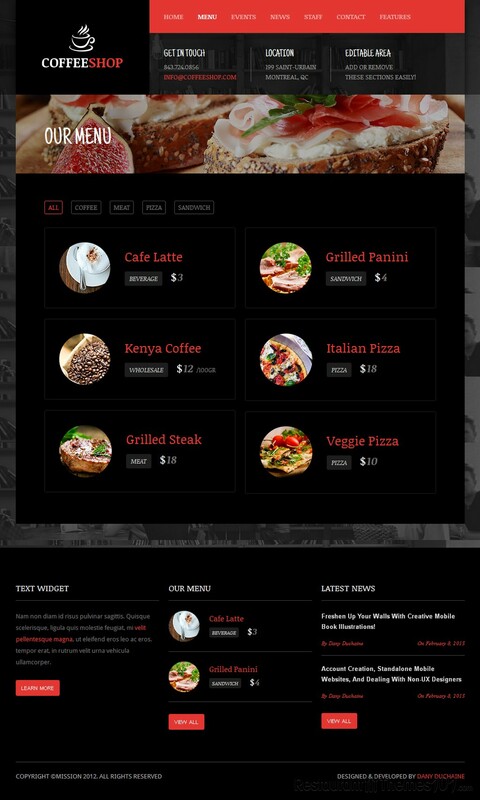 Coffee Shop is a great WordPress bistro theme developed by Dany Duchaine and featured on ThemeForest. 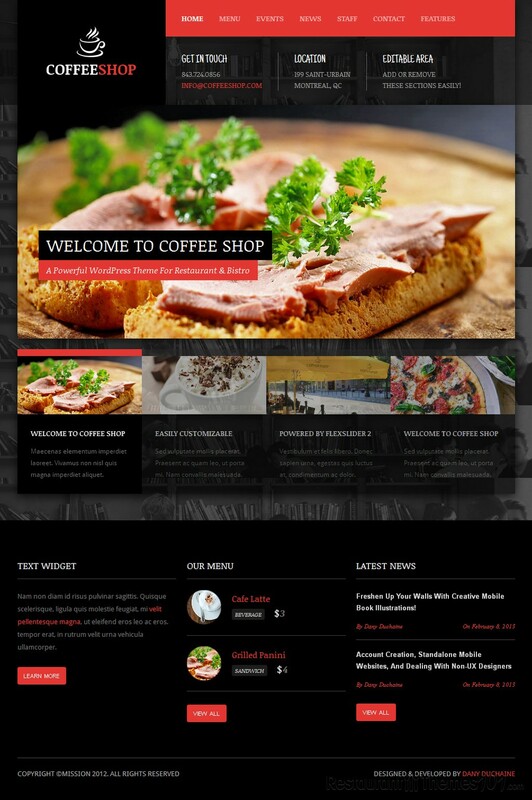 There are many great features and options included that make Coffee Shop a high quality premium WordPress coffee shop template. It is fully localized and it includes .po & .mo files, as well as 5 well-organized PSD files. Installing the theme will literally take 2 minutes of your time and this is exactly how much time you will need to have your attractive website up and running. 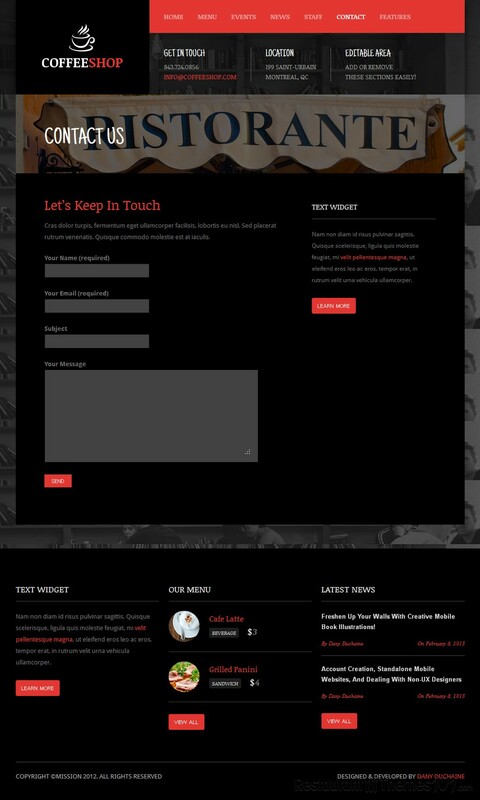 The theme features custom post types, templates and widgets for just about anything, so you can give the theme a bit of your own personal touch and create your own menu, events, recent news, etc. Any custom information you would like to post, such as date, a slider, a Facebook button or any custom inputs you would like to add, can be easily managed and customized. You can even change literally any color on your website in the admin area – very easily. 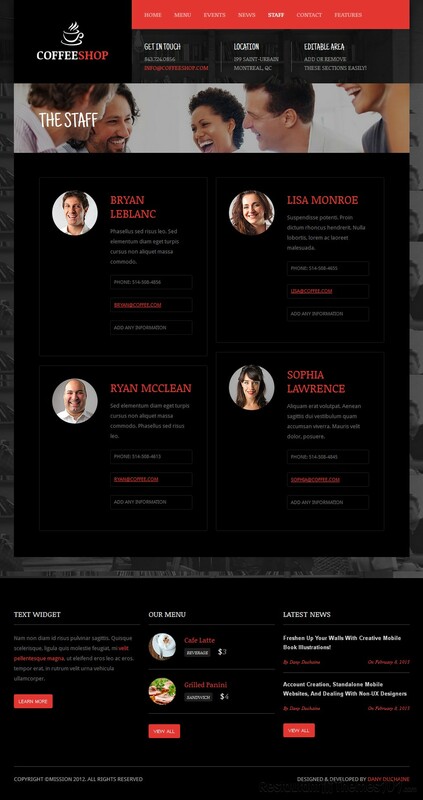 The theme has a responsive layout design, meaning your website will look just as great on any device, no matter if it’s a tablet, and iPhone or any other kind of a mobile device – they are all covered, your will have a great looking website regardless of the screen size & resolution of your customers who are viewing it.